Today is a day that has been long awaited, today I graduate with my GED. Without going into too many details, this has been 6 long years in the making. Yet today lacks the overwhelming joy that it should have. My biggest fan won’t be there. 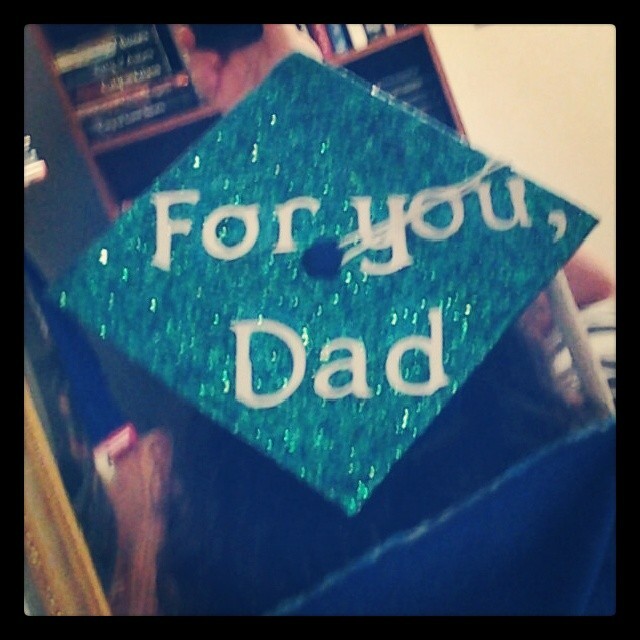 My dad has been my champion through this whole process, when I would be having a bad day and didn’t want to go to class, he would always encourage me with “You can do this. Go today and you’ll be that much closer to being done.” He was always so proud of any little accomplishment, he would always make a big deal out of it and find a way to celebrate it. He was my biggest fan. He never missed a chance to tell me how proud he was that I wasn’t letting what life threw at me stop me from finishing school. When I started high school he would pick me up in the afternoon and more often than not, when we would pass the football field he would say “I’m so looking forward to sitting in those stands and embarrassing you”, I would laugh and say ok. I never realized how much I was looking forward to that moment also. Even though, life decided what I had planned wasn’t what was going to happen and it has taken, sometime what feels like moving heaven and earth to get here, I can now close this chapter in my life. I’m grateful for my dads encouraging spirit and his never wavering belief in me, without his and my moms perseverance I wouldn’t be here today. Thank you dad for being on my side, for fighting for me, and for encouraging me along the way. This is for you, dad. wish you were here. Author littlebitsofme22Posted on December 16, 2013 March 27, 2014 Categories UncategorizedTags dad, graduation, lifeLeave a comment on For you, Dad.